Upon hitting level 10, young hunters will be presented with their first real dilemma in their huntering career...what pet to tame. The choices are many, and most of the different pet types have various benefits to offer, both mechanically and flavour-wise. Some hunters spend hours deliberating whether to tame a lion, a panther, or a lynx, while others just go out and tame the nearest thing with fangs. However, if you are a new hunter, there should be only one option in your early years. A bear. There's plenty of solid reasons why - it's a Tenacity (tanking) type, which means it can soak up a lot of damage while keeping monsters away from you. It also has a great attack, Swipe, that hits multiple enemies, further keeping their attention. Finally, they come in a variety of colors so you have a lot of options. Bears are unquestionably one of the best pets when it comes to leveling. But what makes a bear better than the rest is the fact that bears WILL EAT ANYTHING. It's much, much easier to level without worrying about keeping a supply of your pet's special food on hand. Instead, just feed them whatever random food you find on your travels! Hunter with a non-bear pet: What's that, Koko? You're hungry? Let me sort through my bags and find those gourmet imported Teldrassil grapes I bought for 10 gold last week. Hmm we're out, what else do you want? Oh you want freshly baked bread? You realize we're in a swamp, right? Specifically one of Sorrows? I'm guessing there's not a lot of bread lying around here. Hey, Mr. Bloodthirsty-Dragonkin prowling in the murk, got any fresh bread? How about you, horde of swarming, howling Murlocs? Or what about you, Horribly Overpowered Ganking Dragon, you do any baking lately? Hunter with bear pet: Oh you're hungry, Deathbringer Snarlfang? Here, have this goat leg I found in an old chest. Or this moldy Dalaran cheese that's been in this zombie's pocket for god knows how long. Or this Large Bear Bone that I've been using to hit rats with. Whatever. Just eat. At higher levels, your pet can keep its happiness up by attacking, feeding on corpses, or even just whenever you use Mend Pet on them. But for early levels, nothing beats the effectiveness & feeding convenience of a Bear. Note: Boars are almost as good as bears. They are also tenacity, eat anything, and come in many colors. However, a bear's Swipe ability is better than a boar's Gore. 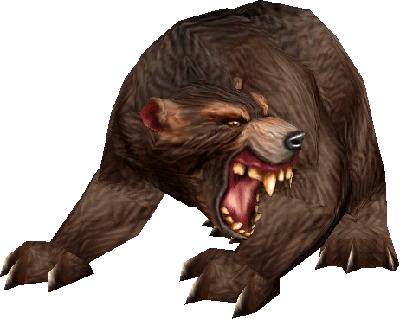 So while Boars are almost as good, bears are still the superior leveling pet choice. This entry was posted on Friday, March 19, 2010 at 12:55 AM and is filed under guides,hunters. You can follow any responses to this entry through the RSS 2.0 feed. You can leave a response. I would personally disagree, but it's really a matter of opinion. I can't stand bears because they have a habit of standing on top of things I'm trying to loot, and they're huge. Being able to eat anything is nowhere near as important as it used to be, what with the minor Glyph of Mend Pet that lets you convert your mana into pet happiness, so you never need to feed it anyway -- not to mention the variety of pet talents that grant happiness from other things. There are definitely ways to keep pet happiness up without worrying about food, but I was thinking for the raw, newbie hunter who can't afford the Mend Pet glyph or has even unlocked pet talents yet, and hasn't the resources to acquire appropriate food for a picky pet. For instance, I just got my Single Abstract Noun hunter to level 10, and I know there's no way I want to use my hard-earned silvers buying fish for a cat, meat for a ravager, etc. when I can just scavenge whatever is handy for a bear. I do love Carrion Birds though, especially the black raven model in Blade's Edge! Buy meat and fish? I usually have a half dozen stacks of random spider parts and pig bits in my bags by the time I'm level 10 (spider legs count as meat, even when they're raw). Even without the glyph and talents, the food in your bags will be meat 90% of the time anyway. Though I completely agree about pets that ONLY eat cheese, bread, mushrooms and/or fruit, it's incredibly inconvenient. I tend to avoid pets like moths and crabs because of it, at least until I can get the glyph.